Universities continue to struggle in their efforts to fully integrate information and communications technology within their activities. Based on examination of current practices in technology integration at 25 universities worldwide, this book argues for a radical approach to the management of technology in higher education. It offers recommendations for improving governance, strategic planning, integration of administrative and teaching services, management of digital resources, and training of technology managers and administrators. The book is written for anyone wanting to ensure technology is integrated as effectively and efficiently as possible. A. W. (Tony) Bates is president and CEO of Tony Bates Associates Ltd., a private consulting company specializing in the planning and management of e-learning and distance education. He was formerly director of Distance Education and Technology at the University of British Columbia. 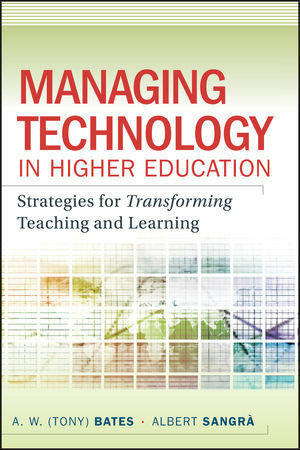 Bates is the author of nine books, including Managing Technological Change: Strategies for College and University Leaders and Effective Teaching with Technology in Higher Education. Albert Sangrà is director of Research and Educational Innovation and Methodology at Universidade Oberta de Catalunya in Barcelona, Spain. He is also director of Edu Lab, an educational innovation laboratory specializing in the application of new technologies to distance education. 1 The Challenge of Change. 2 Recent Developments in Technology and Education. 3 Tracking Existing Strategies for Technology Integration. 5 Organizational Structures and Initiatives to Support Technology Integration. 7 Resources, Money, and Decision Making. 8 Barriers to Change and Two Ways to Remove Them. 9 Building a Twenty-First-Century University or College.